Does anyone know why some values export as Text? I have a custom export template and some values as exported as text and need to be fixed before I can import to GP. Does anyone know how to fix this? 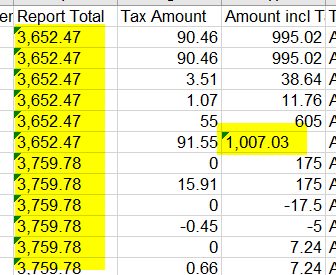 Hi @jbaxter, I'm afraid this is purely an issue with how your spreadsheet program (it looks to be Microsoft Excel) is outputting the Number 1007.03 and other four figure upwards numbers. As you can see, it's simply adding a comma into the number but also then using that logic to confirm the cell is text. You'll note that if you were to open the exported .CSV file with a text editor, there's no comma inserted by Expensify upon export. I'm not aware myself of any setting in Excel that you might want to enable/disable to this end, but currently there's nothing more that can be done in the export from Expensify to avoid this. I'd be intrigued to hear from others in the Community who might have run into this in the past. You can't be the only Excel user here!